Our new 1942 160 LWB "Sedan for Eight Passengers," whom we have named Oveta, is new to Texas. She was delivered to a widow in Boston in October, 1941, right at seven weeks before Pearl Harbor was attacked. So, she is one of the few cars built, by Packard or anyone else for that matter, before civilian automobile production was halted for the war effort in February, 1942. Research shows that only 98 of the 148" LWB models were built in the '42 - 20th series, but it looks like only about 3 actually exist today. Oveta was named, as is Bess, our '51 Patrician, for a famous lady of the period, much as Tommy and Carol have named their '55 Clipper and '40 Super 8 for the presidents of the time: Ike and Franklin. Oveta Culp Hobby was a famous, very independent Texas and Houston woman of the middle 20th Century, and closely allied to the War Effort. Look her up on Wikipedia. "This Packard was delivered in Boston on October 24, 1941 to Mrs. E.F. Stone of Cape Cod. She was alone and had a driver until she died in 1964. In fact, the 1963 Massachusetts State Park admission sticker is still attached to the windshield. Following her death, the car stayed with the family at the estate. In 1975 the car was purchased by the Packard dealer whose family had sold the car when it was new. The dealer kept the car in his collection until 1996. The dealer, Mr. Tom Mix, was quite elderly and he was selling some of his cars when I met him. We got the car from Mr. Mix in 1996 when the car had 42,000 miles on it. We drove the car to Minneapolis from Boston in a snowstorm. We have used the car with our special events business and we have also enjoyed it for family events. The car was always inside, regularly serviced and a meaningful part of our 30 car collection. Never driven in the winter. It had significant work done on the car and is very reliable and it is in excellent condition. 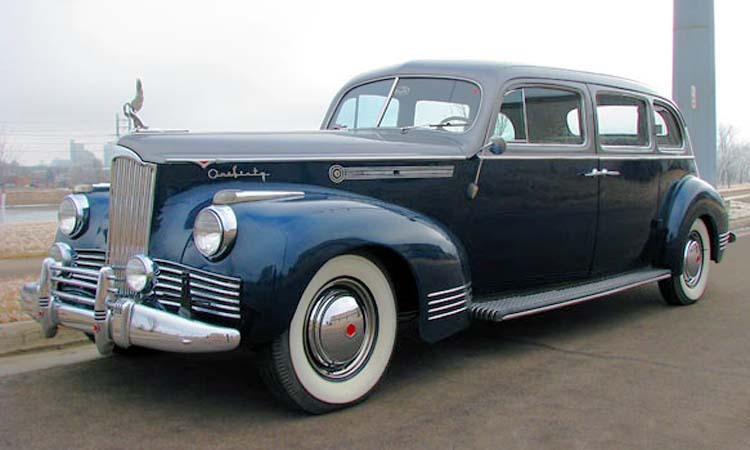 This is one of the few 1942 Packard long bodies remaining." The family is still in Minneapolis, and hated to part with the car, but the eldest son was getting married and needed "family starting money" instead of a classic car. Many brides left on their honeymoons, and many high school seniors were ferried to and from their proms in Oveta over the years. The previous owner said she was a big hit in the Twin Cities for many years. We found Oveta by accident just doing a casual check on eBay. She actually has been listed on the PAC website since early December. When I found it and threw the picture up on the screen, I turned to Dee, said: look; She went "ooohhh" and it was pretty much over from that point on. We flew to Minneapolis and did the paperwork and had her shipped to Houston. Oveta has almost 83,000 miles on her now and runs great, very comfortable, and powerful with the original 356 eight, three on the tree, overdrive, and electromatic clutch. So far, it looks like everything works, including the clock!!! She runs on the original 6 volt system, but she has a 12 volt in a battery box in the trunk that kicks the starter over when a button is pushed under the dash. Works very well, but the 12 has to be charged externally every so often, as it is not connected to the generator. She has two appearance options: the pelican, or cormorant hood ornament, and the accessory wheel covers/hubcaps. They have a design matching the red hexagon insets in the bumpers, and the three inset lines, but not cloissonne like the 180s have. The paint was redone in the original two tone, the interior redone with wool carpet, headliner and door panels, the seats redone in a non-wool broadcloth in the original pattern and style, the chrome and stainless were buffed out, and a lot of mechanical refurbishment was done in the last couple of years. The engine has not been opened, and the frame and undercarriage are very excellent original, not having been subjected to northern salted roads. Except for the snowstorm run from Boston to Minneapolis, she was only taken out in spring and summer up North. You may expect to see her at all sorts of Packard events in the coming years. (Hopefully Bess will be in attendance: we are recruiting nieces and nephews to caravan with.) We are very pleased to be caretakers of this last of the prewar classic Packards.